Blink on most social media platforms and you may miss the conversation. Andy Warhol’s idea of 15 minutes of fame seems like a lifetime by comparison. For marketers, getting social media participants to see and focus on your your posts (and tweets) translates to social media ROI. If your target audience doesn’t see your message, you’ve lost the opportunity to make an impression and start the purchase process. 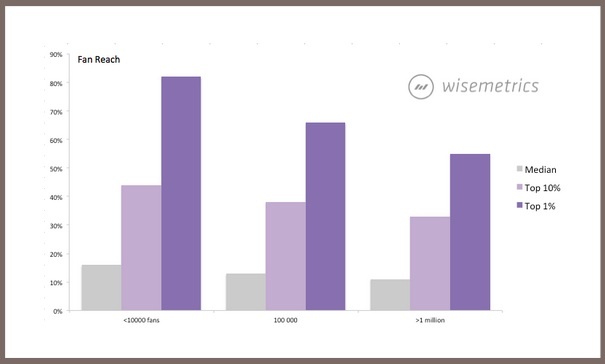 Despite post type and content differences, the lifespan of a Facebook post is short based on Wisemetrics analysis. 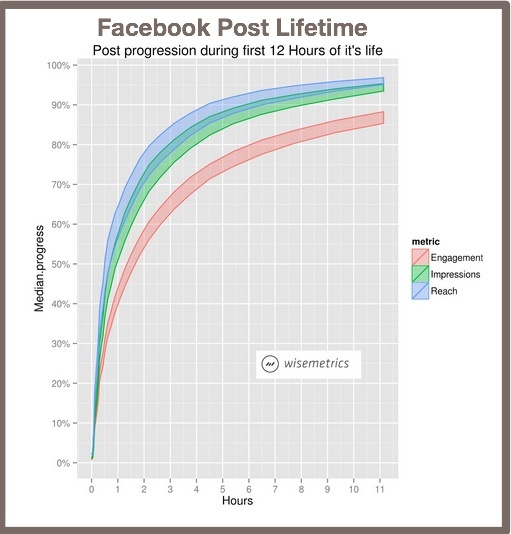 75% of Facebook engagement occurs within the first 5 hours. 75% of Facebook impressions occur within 2½ hours of posting. 75% of your Facebook reach occurs in 1 hour 50 minutes. Think that’s bad? 50% of your global reach occurs within a ½ hour. 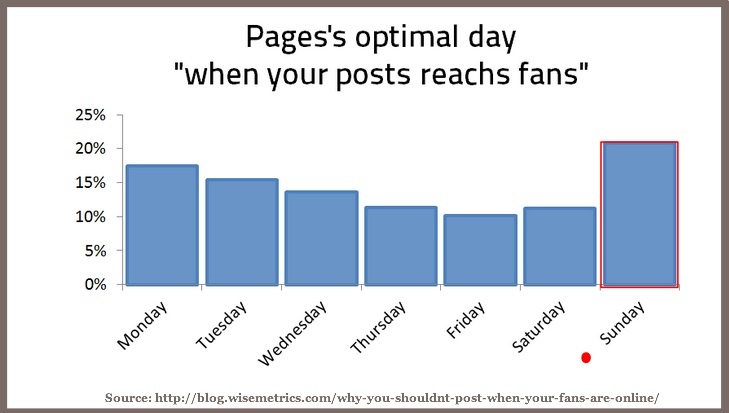 The larger your Facebook Page the more people your posts reach. BUT the percentage of people reached will diminish since it’s a smaller percentage of your base according to data from Social Bakers. Not all Facebook posts are created equal!! Facebook reach has decreased. This is attributable to increased competition for participant attention resulting from a larger number of shares and pages liked. But NOT all Facebook posts are equal!!! 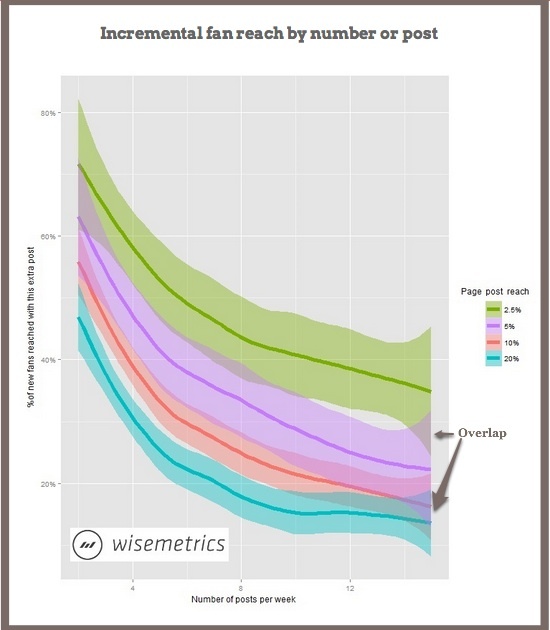 Wisemetrics found that decreased reach didn’t affect all Pages in the same way. 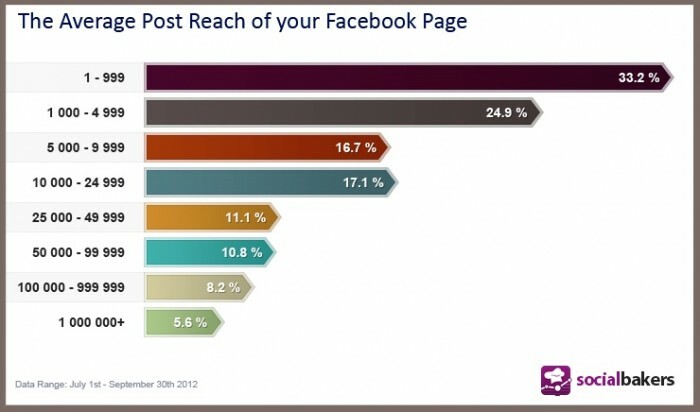 The Top 1% of Facebook Pages reached 5+ times more fans than the average performing Facebook Page. Both the Top 1% and 10% outperformed the median post. These top performing Pages were more resistant to Facebook’s algorithm changes. Use strong headlines to increase your audience from 1,000 to 1,000,000. This finding is similar to other forms of content. 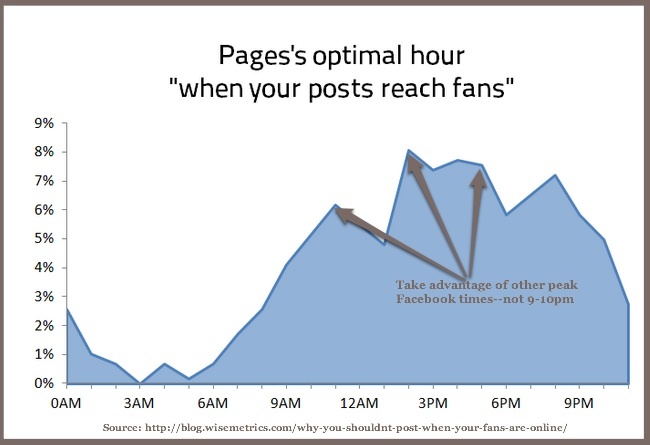 Reposting on Facebook increases your reach if you have low fan reach. The second posting only reaches 30% of the original fans (aka the overlap). 84% of Fans of Facebook Pages are active every day. That’s significantly higher than 61% of Facebook users who are active every day. Most days of the week are similar in terms of the number of fans online. But Sunday is the best day to post! Most Facebook Pages have the same peak usage. 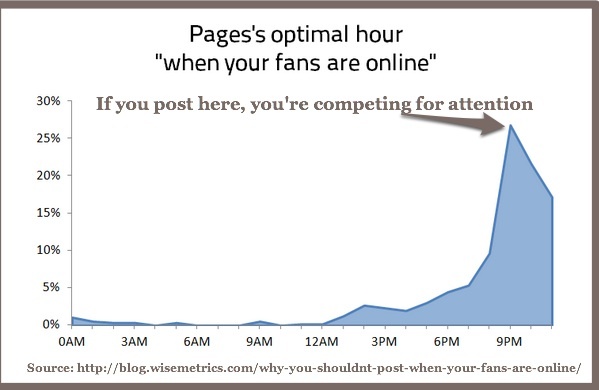 For almost 30% of Pages, the “optimal” hour for posting is between 9 pm and 10 pm. Since most people are on Facebook and posting at this time, your Page has increased competition! This makes it a poor choice for posting. Instead choose another usage peak to reduce your competition for user attention. Timing is even more critical on Twitter than it is on Facebook!!! 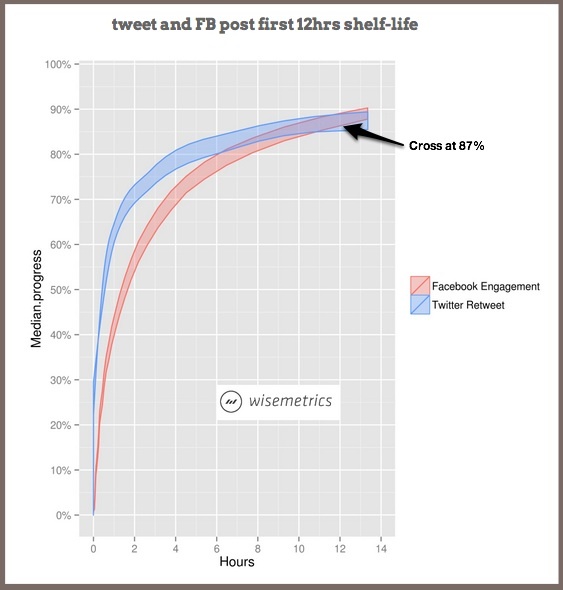 The half-life of a tweet is 24 minutes based on Wisemetrics’ analysis of millions tweets with at least 10 retweets. The real power of a tweet takes place in the first couple of hours. 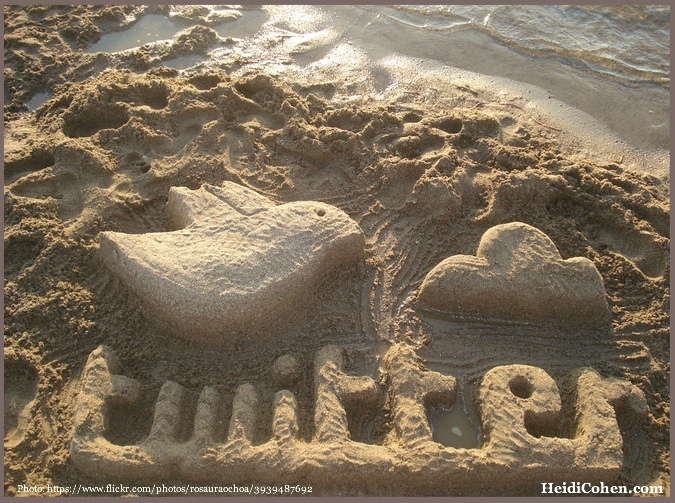 A median tweet reaches 75% of its potential engagement in less than 3 hours. 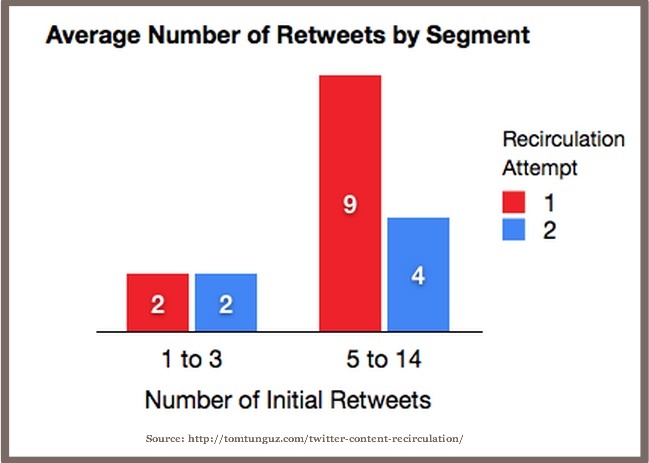 Persistence won’t extend your Twitter reach since less than 10% of RTs occur after the first day. Don’t forget to take some time to understand your Twitter community structure. This will help you to tailor your tweets better. Boost Twitter lifespan by retweeting. Of course, you don’t want to sound like a broken record. Modify your tweets to get more mileage from each one. Don’t stop there–try these 16 ridiculously easy ways to increase retweets. 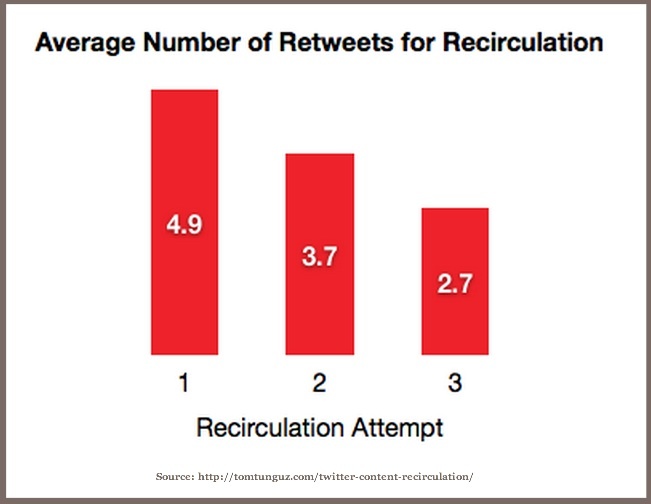 Each subsequent retweet attracted about 75% of the previous number of retweets on average according to analysis by Tomasz Tunguz. To maximize Twitter reach, selectively retweet an article if it attracts 9 or more RTs. Intuitively, this makes sense since a more popular post should yield more traffic. 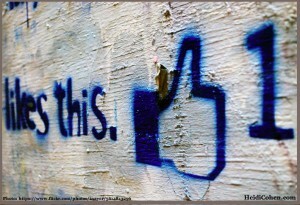 While not all social shares, Facebook posts and tweets, are created equal, you can improve your social share lifespan. Don’t think that your social media is failing. Craft your social media shares to attract maximum attention through the use of strong headlines and images. Then time your social media posting to minimize competition for attention. Also, repost your content to extend your time in the social media limelight and maximize your social media ROI. What other methods have you found to increase social media reach? Tags Chart, Facebook, Twitter. Bookmark the permalink. Some great statistics in here. I find the amount of time tweets are effective interesting. When Twitter first came out they lasted much longer but now with so much noise it can be harder to get cut through.